Another version of my Quiche Pizza – it’s basically a quiche that has a pizza crust and is baked like pizza. I know you’ll love it! Cut the bacon into bite-size pieces and sauté over medium-high heat, adding the chopped yellow onion when the fat has started to come out of the bacon. Add the mushrooms and peppers and continue to cook until the peppers have softened and the onions are soft and translucent. Remove from the heat and stir in herbs and seasonings. Line a 10″x15″ (26cmx38cm) baking tray with the pizza dough, making sure to form sides around the edge, to keep the fillings in. Spread the tomato sauce over the inside of the pizza shell and cover evenly with the bacon and onion mixture. 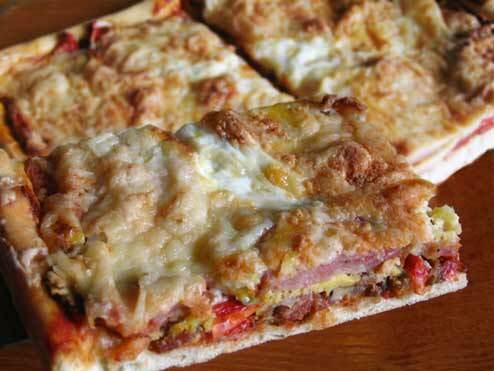 Place thin slices of Polish sausage across the surface of the fillings followed by the grated Mozzarella cheese. Pour the egg mixture over the cheese and sprinkle lightly with Parmesan cheese. Bake at 375°F or 190°C for 20 minutes, then reduce oven temperature to 350°F or 180°C for a further 20 minutes until crust and top is golden and interior (egg mixture) is firm.